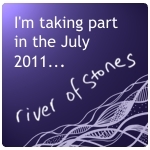 This blog has been inspired by Fiona Robyn's a small stone and the encouraging online writing community she and her fiance, Kaspa, have started, including the project a river of stones. This blog is also an offspring of my original blog, Here & Now, which I would describe as my main blog, the one where you'll get to know me and my ramblings. Both blogs stem from the philosophy that at the very core of it all is being- being in the here and now, because, really, where else is there to be? As Fiona and Kaspa write, "A small stone is a moment of paying proper attention. Writing them helps people to engage with the world around them." And so here I am, sharing my small stones with you, dear reader.